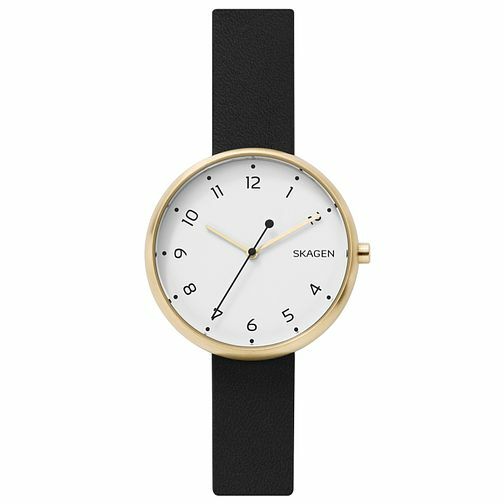 A beautifully modern offering from Skagen, this bold timepiece offers a gold tone case, black leather strap, a white dial and minimalistic indices with classic logo branding at the 3 o' clock position. Combining fashion and function, this elegant watch will be a staple addition to her everyday wardrobe. Skagen Ladies' Gold Tone Strap Watch is rated 5.0 out of 5 by 1. Rated 5 out of 5 by Anonymous from Beautiful watch Very pleased with this watch. Exactly as described & the watch face is a perfect size. Rose gold face just beautiful too.